A sleep study is a non-invasive test which requires a number of electrodes and sensors to be attached to your child, before they go to sleep. The attachment of these electrodes and sensors to the skin of the head and body is safe and will not hurt your child. 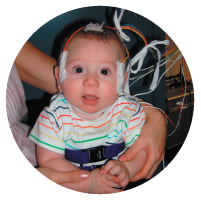 A sleep study allows us to monitor and record your child’s sleep, looking at both brain waves and breathing patterns. Throughout the night, specially trained staff will observe your child on a video monitor in the room next door. The staff will ensure that the information collected is of good quality and is a good record of what your child is doing during sleep. Staff may need to enter the room during the night to re-attach electrodes. Unusual nighttime movements or unexplained nighttime wakings.